So it’s three days left until The Convo holds and I’m really excited because I strongly feel it’ll be eye-opening and life-changing for many. I’m looking forward to learning new things and if the past few months have been any indication of how much I have to learn, then there’s a lot to look forward to. I have a couple of things to say about tickets. First of all, I want to say a huge thank you to everyone who sent me an email telling me why they deserved a ticket. I was able to find reasons that merited a free ticket. The winners of the free tickets have been notified. Thanks again for participating and as per my email/message/tweet, you just have to give your full name at the entrance and you will be allowed in. I hope to see you guys after the event. For those of you still interested in grabbing a ticket there is a discount available. Just visit http://www.afritickets.com and type in the discount code “twb” before you buy your ticket. Once again, tickets are only available online and only until Friday. Please see the flyer again for more details. That’s pretty much it from me today guys. I got an immensely encouraging e-mail from a reader today. You know who you are and I just want to say that you ever so much. God definitely used you to speak to me and as long as He keeps giving me the words and the grace, I will keep writing. Stay safe y’all and have a lovely weekend. Hopefully, the next time I write, I will be safe and sound back at home. Trust y’all are doing great. I’m excited today for two reasons. The first is that my time in Dubai has almost come to an end. I am leaving soon and looking forward to going back home. The second is that The Convo is exactly a week away and I’m super hyped. I’m looking forward to meeting some of the readers of this blog and getting some new nuggets of wisdom where dating is concerned. Which brings me to the results of the trivia. Now I got several complaints that my questions were ridiculously difficult which probably explains why I didn’t get much of a response from y’all. Now although I’m a little heartbroken (sob sob) because the response was kinda not good at all, I have decided to learn from it and move on. Next time, my trivia questions will be reader friendly…….lol. But I did give away two tickets to someone who really put in crazy effort to answer those questions (I admit, they were crazy hard). So dnddyon, you are the proud winner of two free tickets to The Convo. Please send me your full name and number as well as that of your guest. I look forward to meeting you next week. That means I still have three free tickets to give away. Now because I really want to give these tickets away, I’ll make it easy on you guys. I’ve decided to let you tell me why I should give you a free ticket. The three most compelling answers I get will be winners of the last three tickets. So it’s all up to you guys. If you still want a free ticket to The Convo, send me an e-mail at aokwodu@yahoo.co.uk, telling me why you think you deserve a free ticket. Please send in your answers by Tuesday, 19th August at 12p.m (G.M.T + 1) and I will announce the winners later that same day. I look forward to reading your answers (please send them in this time guys, I’ve made things much easier ;)). When I was thinking of what to share today, it came really quickly to me. Today’s post won’t be too long, just a summary of what I’ve learned over the past two months. I’m really grateful to God that He continues to open my eyes and heart to things He wants me learn. As time goes on, I’m growing and although that might make some of you want to say “duh”, the truth is that not everyone can say that. So I urge you to celebrate your growth. When you realize that you are not the same person you were some time ago, you ought to understand that it’s enough reason to be grateful to God. Own what you want. There are times in our lives when we want something because we think we should want it. We see that other people want those things and in order to not feel left out, we join the bandwagon and want those things as well. The truth is that the less travelled paths in life often have the greatest rewards. So if you know that your desires (aligned with Christ) differ from the desires of the masses don’t feel ashamed or left out. Understand that your calling is different, bask in it and own it. Make decisions based on purpose, not possibilities. Now I “stole” this from Tobi Atte. Check out his latest post on http://www.ijustmetme.com. A lot of the time, we find decision-making difficult because we try and decide based on ALL the available choices. For example, you want to buy a pair of shoes (now this is the kind of decision I love to make, being the shoe-lover that I am). The thing is it’s easy for me to decide what shoes I want to buy based on the criteria I have for buying new shoes. First of all, they must be high (unless I specifically want flats for work). Secondly, the color must not be one I already have in my cupboard. Thirdly, I must fall in love with those shoes the moment I lay eyes on them. If I feel “just okay” about those shoes, then I’m not buying them. This makes my life a whole lot easier when I’m buying shoes because I stick to my criteria. But a lot of us don’t even have criteria when we are trying to make decisions. And even if we do, our criteria are based on wrong ideologies and not on who we are, what works best for us and what God has called us to do. There’s so much to say on this so please check out Tobi’s post on why making decisions can be tough and how it can be made easier. Don’t judge people, not a single person. I learned this in a big way and it made me really understand that God wants every single one of us to extend love to every single one of us. And I mean EVERYONE!!!! I have learned not to judge anyone or think myself more spiritual than anyone because we are all on a journey. Loving every single person will help them on their way to finding God. I myself can be judged because there are areas of my life where I am not doing well. So when I look at someone that I think of myself as “better than” spiritually (I have no right whatsoever to do that), I remember that I’m supposed to see them as God does, the same way other people see me as God does. God ABSOLUTELY knows what He’s doing. I know this seems like a self-evident truth but sometimes it’s easy to forget when life throws curveballs your way. No matter what you’re going through right now, no matter how seemingly large or inconsequential, as long as you remain in God’s will you can trust in the truth that He is working something out for you, in you and/or through you. And one day, you will look back on those times and be grateful for the fruit that was produced. You can take that to the bank. Kk that’s it from me today guys. I hope this speaks to someone. Please please send in your answers for a free ticket to the Convo. I really hope to see you all there. Have a blessed weekend guys and know that God is totally in love with you. As promised, I have (for now) five free tickets to give away for “The Convo”. I’m looking forward to it and hoping that I can meet with you guys that read this blog and connect with you. Just as a reminder, the event is on Saturday 23rd of August at Nike Art Museum & Gallery. The address is 2 Elegushi Road, Off Ikate Roundabout (3rd roundabout after Lekki Toll Gate). Time is 2.45 (sharp, no Naija time please, I dey beg una). Alright guys, it’s trivia time. The first five people to answer these questions correctly will get free tickets to the Convo. Please send in your answers to aokwodu@yahoo.co.uk along with your name and phone number so I can reserve a ticket under your name if you’re a lucky winner. Good luck y’all. 1) How many posts are on Grace’s Daughter? 2) What is Grace’s Daughter’s favourite colour? 3) Which of the following is not one of Grace’s Daughter’s greater passions? 4) Which of the following cities has Grace’s Daughter not blogged about traveling to? 7) How many comments are there in total on http://www.gracesdaughter.com? 8) The writer of Grace’s Daughter is currently in which of the following cities? (A) Luxembourg (B) Cape Verde (C) Brazil (D) Trinidad & Tobago (E) Scotland. Phew!!!! That’s done thank goodness. Kk…..I’m really excited to see all your answers now so please send them in people. The deadline to get them is Monday the 11th of August. Time is 12pm (GMT + 1). Thats it from me today guys. Enjoy the rest of your weekend. Hope y’all are doing great, I’m not doing too bad myself. The past week has been pretty chilled; things at work are starting to pick up again as the holidays are over and I’m looking forward to going back home. The news in West Africa has been quite worrying with the Ebola breakout. So please be careful everyone; watch what you eat and where you go and carry your hand sanitizer with you. Better safe than sorry. I’ve been struggling to figure out how to write today’s post. It’s been on my mind for a while and I’ve talked about it before in my previous posts. 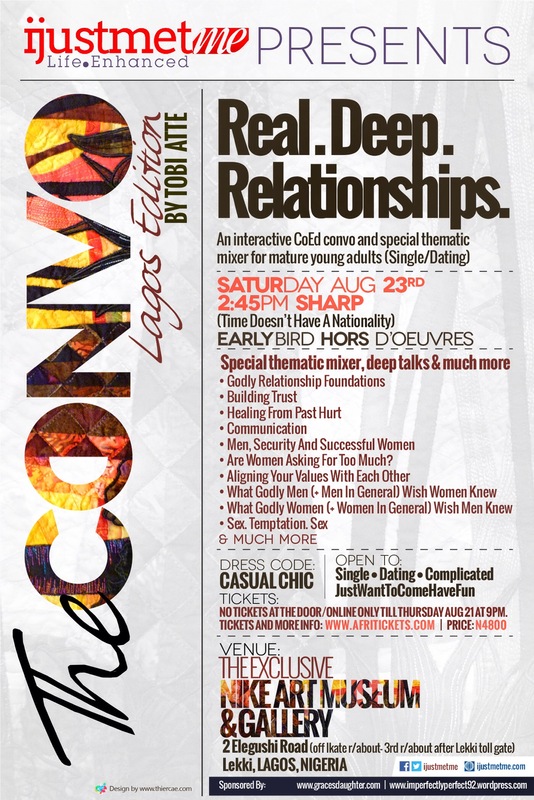 There’s an event called “The Convo” that I am privileged to be part sponsoring. I initially thought to tell you guys about it from a purely promotional angle: “Be there guys…it’s gonna be amazing….awesome this…fantastic that…blah blah” and there’s nothing wrong with that approach but it’s not consistent with who I am and what I do on this blog. So I’ll just tell you plain and simple how I used to carry a terrible dating philosophy and how exposing my mind to sound dating philosophy, consistent with Scripture, got me to where I am today. I’ll end with why I believe attending “The Convo” could help you with yours. I remember when I was obsessed with romantic movies; I’ve watched the Notebook at least 70 times (and I’m not exaggerating). I was obsessed with falling in love and meeting a guy who would love me flaws and all. Now there’s nothing wrong with that at first glance but something about my whole approach was not working and I didn’t know why. I had heard things like “You have to be confident” and “Put yourself out there” and again there’s nothing wrong with that. But my mind was not right. Sometimes what you want to hear is exactly opposite to what you need to hear. The danger of my former dating philosophy was that I was opening myself up to attacks from wolves in sheep’s clothing. My former mindset meant that I was desperate to get into a relationship and guys can smell desperation a mile away. There were guys that I started talking to but I knew after a couple of interactions that they only wanted a quick lay and they figured I’d be easy because they thought I would do anything if they “validated” me by getting into a “relationship” with me. Quite frankly, it was only God’s grace (which I didn’t understand at the time) that kept me from being badly burnt. Another problem was that not many good guys (and contrary to popular opinion, MANY of them exist) wants to be with the kind of girl that I was. They want women that know who they are and what they bring to the table. They want a woman that wants to be with them but doesn’t need to be. A woman who knows who she is is strong and can handle the truth; a needy desperate woman cannot handle the truth and will often tell a man what he wants to hear instead of what he needs to hear. Good men recognize the need for a strong partner who isn’t afraid to disagree with them and will still root for them. The problem with seeking a man’s validation is that you’ll do just about anything to get it; even give pieces of yourself away. And often times, the kinds of men that ask for it are not good for you. Now the next line of thought would be how I went from that girl to who I am today. Well I had to sit back and acknowledge that I was doing something wrong. Thankfully, it was during the period in my life when my relationship with God was developing so I started to investigate dating from His perspective. I read books on dating and womanhood by Michelle Hammond, Eric & Leslie Ludy and eventually Heather Lindsey. The thing I want you to note is that I sought knowledge on the matter. When Tobi Atte approached me to sponsor The Convo, I checked him out as well as the videos of his events on Youtube and they not only resonated with me but I learned things that helped me at the time as I was still trying to decide whether to enter a relationship with my boyfriend. So when I recommend this event to you, it’s also because his words have (and continue to) bless me. So that’s it people. The Convo is for mature people who realize that they don’t know it all where dating is concerned and are open to some real hard truths. I hope you guys make it and have attached the flyer below. I have some free tickets that I will be giving away in the next posts. Y’all will have to answer some Grace’s Daughter trivia so y’all better go do some revision. See you soon. Trust you’re all doing great. I’m doing good myself and have some wonderful news to share with y’all. So you know the exams that took over my life for the first half of this year (the legendary CFA), well I passed thank God. I honestly was not sure what to expect ’cause I left that exam hall trying to console myself, saying there was no harm in failing and I could always take it again in December. But God showed up and took over so really and truly all the glory for this goes to Him and Him alone. He equipped me with the strategy to use while I was studying and gave me the grace and strength to put in the work. He gave me the ability to do my part and showed up when it was time for Him to do His. My results have been out almost a week now and so the high of passing has tapered off a bit. We’ve had a week-long holiday in Dubai and so I’ve had some time to just relax and take everything in. In my assessment of the first half of the year, I talked about my gratitude to God for all the blessings He’s given me. It’s funny how not too long after, He’s given me another thing to put on my list of things to be grateful to Him for. I had a conversation with my mum (who is quite simply one of the most amazing human beings ever) and she spoke to me about how amazed she is at how far I’ve come. She saw me at my lowest four years ago and so she’s one of the few people that can fully appreciate how far God has brought me. I guess what’s on my heart to say today is that it doesn’t matter where you are; how low you think you are or how far you think you’ve fallen. There is absolutely nothing that God cannot restore. You just have to give your life to Him (trust me, it’s easier than trying to figure it out on your own) and allow Him to have His way. I wish you could have met me four years ago; my confused, bitter, resentful, mouthy self. You might read my posts and think I was always like this but that is so not the case. I was the bottom of the dung heap before God lifted me and placed my feet upon the rock. It was not an easy process; I had to let go of many things and there was a season where I had to be away from the people I loved so I could give God my full attention. But it was soooo worth it. If I knew then that this was what He had in store for me, I would not have worried one bit. Now it’s easy for me to say that ’cause I have the benefit of hindsight, but there are still things I struggle with today like my career and where He wants me to be. However, by His grace, I can hold onto the things He’s done and have faith that He will always show up for me. I don’t know who exactly this message is meant for today but I want to let you know that God loves you and has grand plans for your life; so huge that even if you sat down today and thought of the most amazing things that could happen to you, it could not compare to what God has in store for you (Ephesians 3:20). Let go of the past and hold onto God for your future. Set your face like flint and focus on the Father. He will take you places you never thought you could go. I'm a young lady whose life has been changed by God's love. I see His hand in my life everyday and He makes it an evolving testimony. I love to sing, dance and hang out with friends and I hope that people can come to this blog and be encouraged that no matter what they've done or where they've been, they can never be too far away from God's love. With proper guidance I could be an amazing photographer, a dancer, a great actor, a style icon...I can already sing so that doesn't count.